Luckily for you, there's no need to get a plane ticket to go halfway around the world in order to purchase a beautiful parasol. We can make sure this pretty accessory is in your possession in no time at all. Whether you want to use it to block the sun's rays on a hot day or you're searching for an authentic prop to pair with your kimono costume, this umbrella is exactly what you need. This lovely oriental parasol expands up to 34 inches around and will supply you with an ample amount of shade on any sunny day, keep you dry on the rainier ones, and even ward off evil spirits! The delicate design printed on the fabric canopy resembles the hand-painted masterpieces made in many different countries all over Asia. The branches of the flowering tree have a hand painted look with both red and blue flowers. 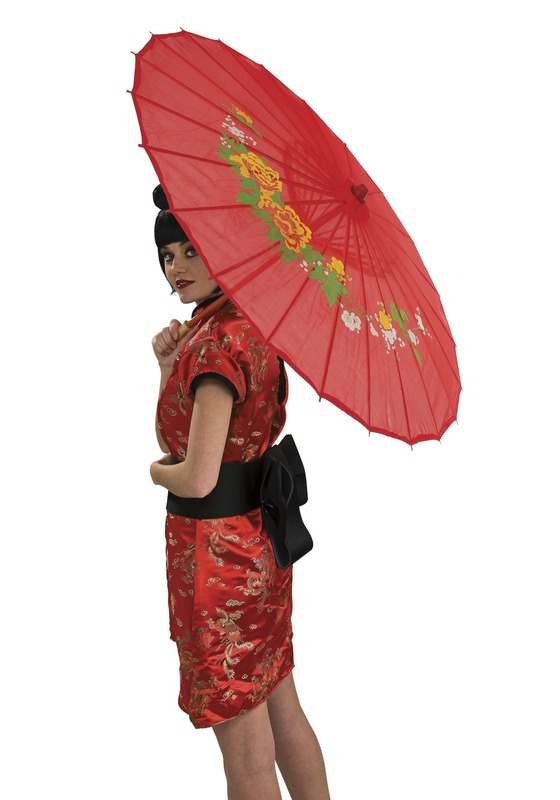 The gorgeous parasol matches a variety of our kimono costumes for girls, teens, and women. It will add that gentle touch you might be looking for. This could even match with a Victorian dress, after all, every lady could use a little flare!